We offer Coaching Programs, Workshops and Courses, for health and wellness, as well as, Mindful Leadership and Governance to sustain high performance and create resilience. A growing number of organizations are using Mindfulness Meditation as a success strategy and improving their health and financial performance. At Argonauta we believe that corporate success starts with a well developed corporate strategy. Now available, the Mindful Leadership App with 12 Categories and over 70 Guided Meditations. Categories include Managing Stress, Managing Migraines, Flying with Ease, Mindful Golf, Mindful Music, Micro-Meditations and Mindfulness in Action Strategies, to name a few. The App is available on iPhone, iPad, Androids and tablets. Effective leaders are self aware and empower those they influence to achieve their potential. Mindful Leadership is a guide to leadership that starts with the self—for business people, members of the public service, professionals, and anyone else in a position to influence others. Essentially, it is of value to anyone who aspires to make a difference. transform yourself and achieve positive results by inspiring those you lead. anywhere, to improve yourself as a leader. Beginning with the simple act of being fully present, mindfulness opens up the 9 ways to become more effective in every aspect of life. Maria Gonzalez (BCom, MBA) is an award winning and best-selling author and a 30-year business veteran as a corporate executive and entrepreneur. She believes that Mindfulness transforms lives and organizations, and that it has the potential to transform society. She has been meditating regularly since 1991 and teaching Mindfulness since 2002. She applies Mindfulness to all aspects of her life, both personally and professionally. As founder and president of Argonauta Strategic Alliances Consulting Inc., she ensures that mindfulness is indistinguishable from her business, whether negotiating complex strategic alliances, doing strategy consulting, or coaching business leaders, professionals, entire teams, organizations or individuals in mindful leadership. A growing number of organizations are using Mindfulness Meditation as a success strategy and improving their health and financial performance. This easy-to-learn technique increases focus and concentration, job satisfaction and the soft skills required for effective leadership. 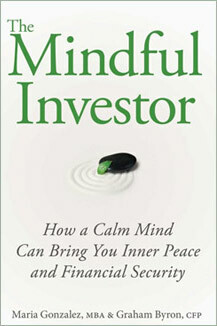 "Maria introduced me to the fundamentals of mindfulness in a way that was tailored to my particular needs. I am now able to approach the day with an objectivity and equanimity concerning things outside my control I never thought possible, while at the same time having an intense appreciation of the present moment – an awareness of my physical surroundings, a greater understanding of the people I meet and interact with, and a greater focus on what I need to prioritize both for myself and the people who are close to me." "Maria's warmth and deep wisdom shone through from the first moment I spoke with her. I felt so grateful that she was able to speak at my office in Queen's Park, and in that way share the gift of mindfulness with many that had never heard the word before. Everyone was taken by Maria's presentation. Not only was it simple and tremendously effective in demonstrating the importance of mindfulness in our high-stress world, but it was also experiential. Everyone walked away having felt the power of what bringing our attention to the present moment can bring. Maria's approach to leadership and her emphasis in applying mindfulness to our everyday tasks and interactions will undoubtedly improve our lives, our workplaces, and our world. Thank you, Maria!" 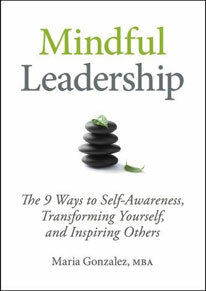 "I first became aware of Maria's work by my purchase of her book, Mindful Leadership, in an airport bookstore. The book was simple and straightforward and appealed to me as a business book, but with the recognition that leadership is a process that involves building skills beyond the superficial "do's and don't's" outlined in many other business books. The idea of "mindfulness" attracted me as did honing my skills on reflection, concentration, clarity and equanimity to create a deeper appreciation of leadership. After the purchase of the book, I wanted more so I contacted Maria and did the one on one coaching. My idea of success in training is that it changes the way you will do things in the future. And that is what I gained from Maria." Alyson Townsend, President & CEO, Canadian Cable Systems Alliance Inc.
"I originally embraced meditation in an attempt to battle the too often occurring migraines that came along with menopause! But oh what an amazing journey it has turned out to be! I was unprepared for the benefits that resulted from a daily practice. The least of which was a reduction in migraines. Little did I realize working with Maria would help me make better decisions at work and better "hear" what my clients were saying! Much to my surprise I became more focused and creative in all aspects of my life. I've since told anyone who would listen that this is a "must do". And not to be intimidated as it's not difficult when you have someone like Maria to teach you the skills to excel." "The techniques I've learned from Maria have enabled me to work through some difficult emotions to find my way back to inner peace and freedom from my irritants. They continue to assist me in making the journey back to myself, with patience. Aside from what I learned and am able to apply practically, Maria's pure presence taught me more than I could have ever imagined. She is patient beyond measure, compassionate with every student, and presents herself with such grace, that I found myself in awe and inspired to find a deeper sense of peace within myself and more patience and compassion while working with others. Although the workshop was just two days, my life had been enriched with purpose and meaning because of what Maria so generously gave of herself. " "Within weeks of taking your Mindful Leadership course at the University of Toronto, I have become aware of the driving forces behind my actions, and thus change the responses. Thank you, Maria, for your gift of freedom." "Maria is special. She exudes calmness and clarity, you know you are in a very honest presence . I am a physician: very typical, easy to control migraines were becoming worse, not better with time. I began seeing a neurologist not knowing she is probably the best in the city when it comes to headaches. So called natural remedies and recommendations were tried, as well as, many medication trials. I was becoming worse and very despondent. One day as I was about to leave she suggested I connect with someone named Maria Gonzalez, giving me her phone number, telling me she had done work on Mindfulness with Harvard; and told me to look at her website, not much more. Meditation was the one area in terms of health where I did not practice what I preached. I think I wasn't sure I could find 10 or 15 minutes to sit and be calm. Well , Maria opened up a very new door with a fascinating, positive, hopeful inside. She made it very clear that she could not cure my headaches, but, hopefully help me to better cope with them. Of course, that is the case, but so much more, and so different from what I expected. Although Maria's world is the business one, she works with people from many walks of life. Her teachings are universal and mind turning for me is her belief that if we all practiced Mindfulness the world would be a very different place. Also, fascinating for me is the fact that there is MRI evidence that Mindfulness can actually create changes in the brain. Her teaching method is very forgiving, always leaving room to achieve. Maria worked with me, teaching me meditation techniques I could use during my daily half hour time. To truly be in the moment is not easy, but possible. Maria goes beyond her required one-half hour commitment to teaching one how to be mindful / in the moment always. That is challenging – for me, but so rewarding if done. When you pick up your cup of tea, savour the sip – how beautiful is that! Maria told me I would find that I would have more time in my day, and to give it to myself. I have and I do; it's wonderful. My practices are apparently at a very basic level. I feel that to do what Maria has tried to impart to me will be enough to make me and my life very different . A special person with much to give. " "I cannot praise Maria enough for sharing her gift of Mindfulness with others. Taking Maria's course changed my life in many ways. I attribute Maria's course with fulfilling a very special goal of mine which was having a family after 3 1/2 years of no success. Since her course I have also been able to focus on my career goals and have started my own business with another one of Maria's students. " "Thank you Maria for all you have taught me, your course transformed my life. As I read from your book "Mindful Leadership", one line stands out: "...as you move through the world as a mindful leader, you will touch the lives of many, some in big ways, some in small ways." Maria's insights and abilities as a teacher and a mentor touched my life in a "big way", and for that I will always be grateful. "